Edwin McArthur Interview with Bruce Duffie . . . . . This interview was originally planned to celebrate the 80th birthday of conductor, accompanist, and biographer Edwin McArthur [September 24, 1907 - February 24, 1987]. His death has turned it into a remembrance and a memorial to the man who was the friend and confidante not only of Kirsten Flagstad, but also of so many other musicians. In addition to over 1,000 recitals he played for Mme. Flagstad, he also accompanied Gladys Swarthout, Ezio Pinza, Elisabeth Rethberg, and John Charles Thomas. His conducting engagements included tours with the Charles L. Wagner Opera (with which company he presented 75 performances of Madama Butterfly in a single season! ), and being musical director of the St. Louis Municipal Opera for 23 years. He also taught at the Eastman School of Music, and gave many master classes. 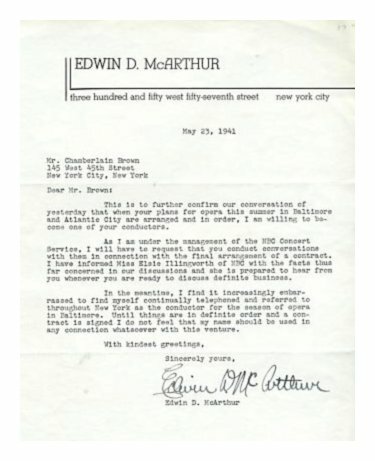 No matter what else his career brought, the name of Edwin McArthur will always be linked to that of Kirsten Flagstad. 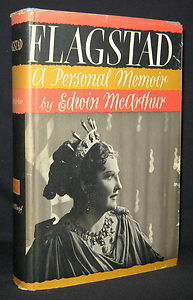 His book, Flagstad – A Personal Memoir, published by Knopf in 1965, reveals the many-sided career which took the great soprano all over the world, and involved McArthur in so much of that international career. 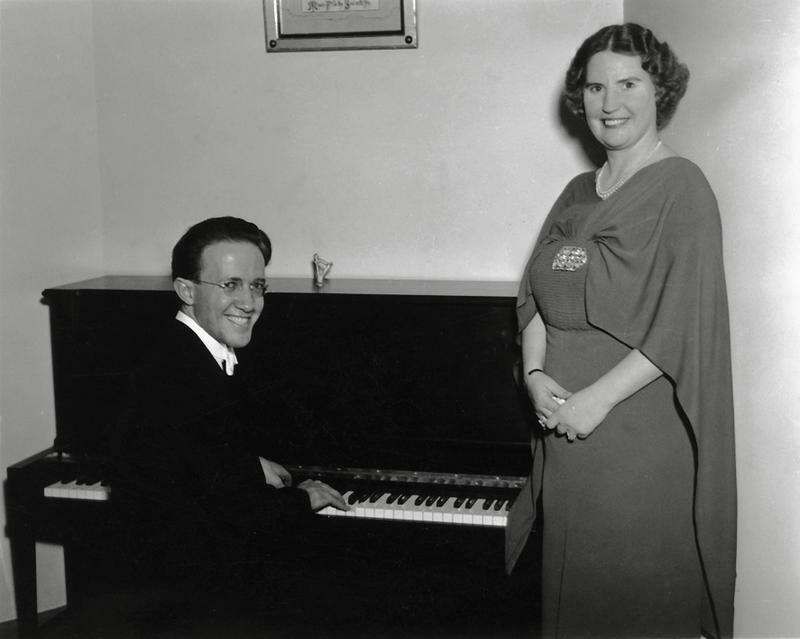 He conducted her performances in San Francisco, Chicago, at the Metropolitan, and in the recording studio. Being so closely involved with Flagstad, he naturally became closely involved with the music of Richard Wagner. In April of 1985, McArthur was in Chicago for a dinner honoring the memory of impresario Harry Zelzer. It was there that I had the opportunity to chat with him for about 45 minutes. Still tall and slim, he moved a bit more slowly than before, but his mind retained numerous details from his most distinguished career. He seemed pleased to be able to chat about Wagner, and even though Mme. Flagstad did come up in conversation, our thoughts centered mostly about Wagner in general – both recently and farther removed. His opinions were forthright, and came from his nearly unique background. One special note: As readers of these pages might remember, in March of 1985 I presented a long paper devoted to performances of Wagner operas in Chicago before the formation of Lyric Opera in 1954. In that paper, I noted the “Flagstad/McArthur marathon of Thanksgiving 1939.” Looking over the annals, it was clear that this was an out-of-the-ordinary event, and in talking with one of the participants, I found out just why it turned out the way it did. [To read that paper, with additional photos and other material, click HERE.] That, plus much more of the conversation is all presented now…..
Bruce Duffie: How has Wagner changed in the course of so many years? Edwin McArthur: Anything one could say as a reason would be a personal opinion. Some of what I tend to say is dangerous, but I’m at an age when I don’t have to be too careful. But to answer your question, it has changed shockingly. When I went to New York in 1925, Wagner had resumed his life in the history of the Metropolitan. A person has to look at the annals to see what had happened. BD: His works were simply not done during the First World War. EM: That’s right. Artur Bodanzky was the great conductor during that time, but he conducted quite another repertoire during those years, so he remained on the staff at the Met. When Wagner performances first resumed after the war, they were given in English. Marion Telva, a great friend of ours, whose great claim to fame was singing Adalgisa in Norma with Rosa Ponselle, made her debut as Brangaene with Florence Easton as Isolde. That was one of those English performances. At that time, Wagner was a regular bill of fare. It was unthinkable not to have Wagner – and Verdi and Puccini. Those three. When people nowadays say “We’re going to have Aïda this year,” I have to smile because it was never dreamed not to have Aïda. It was just standard. They might miss a season of Trovatore, but not Aïda. And from my first days in New York, there was always a Ring cycle. Remember, this was in the days before Kirsten Flagstad. Too many people from the younger generation date the whole thing of Wagner to the days of Kirsten Flagstad because she was such an outstanding personality, but long before she came to America, there was an annual Ring cycle at the Met. BD: We had Ring cycles here in Chicago in 1915-16 and 1916-17, both times with Clarence Whitehill. EM: Clarence Whitehill was the first one I heard sing Amfortas. Getting back to New York, there was not only a Ring, but there was a Wagner matinee cycle annually. Seven performances of the Ring and Parsifal, and two other operas which would vary – one year it would be Meistersinger and Tannhäuser, another year it would be Lohengrin and the Dutchman. Those matinee performances would be the only time during the year that the Ring was done uncut! During the season, big cuts were made. Those matinee performances would, almost without exception, be on Tuesday afternoons. There was a good reason for that – they were patronized by a large segment of the theater profession. Those performers weren’t free on the regular matinee days because they were giving their own shows. Also, people who went to the theater matinees could come to the Wagner matinees since they were on Tuesday. So that was the basic thing. Then for years there was never a Good Friday without Parsifal. It was always done. BD: Even if there were no other performances of Parsifal in that season? EM: Having to put up Parsifal for Good Friday, there were always one or two or three other performances beside that. There were always six or seven performances of Walküre, four or five of Siegfried and two or three of Götterdämmerung, and there was hardly a season we didn’t have Tannhäuser or Lohengrin. But the point I’m coming to is that in New York, and Chicago along side of it, just those two cities determined the tempo of opera in America. They gave reason for a whole generation of singers to work on the repertoire of Richard Wagner. Today, it’s very difficult for young people to be encouraged to prepare themselves for those roles, even if they may be the coming Melchiors and the coming Schorrs. Where are they going to sing it? Where is there going to be an outlet? In his wonderful autobiography, Giulio Gatti-Casazza clearly explained what a tremendous Wagner enthusiast he was – even though he was Italian. He ran the Met from 1908 until 1935, and was succeeded by Herbert Witherspoon who died just a few weeks later. Then came Edward Johnson who lasted until 1950. But during those difficult years, especially during the war when he couldn’t get singers from Europe, Wagner, along with Verdi, was the bread and butter of the Metropolitan. Then when Mr. Bing took over, he repeatedly stated that he didn’t have a feeling for Wagner, and little by little it came out of the repertoire and was replaced more and more by Mozart. Little by little, the Wagner singers disappeared. There was a claim that the public was no longer interested in Wagner, but that is absolutely ridiculous. They’ve given two performances of Parsifal in the last week and there are two more coming, and you can’t buy a ticket for love nor money. BD: The singers today must have something going for them to sell out the performances. EM: When I went to New York, the first thing I wanted to do was go to the Metropolitan, and it happened that my first opera there was Tannhäuser with Jeritza. Now when I went there from Denver, I had every right to believe that I was hearing the world’s greatest. Doesn’t a youngster today have the same right? If I tell him it’s not as good, then I’m a sour puss. This is the danger in the whole thing. BD: Is there, perhaps, too much opera going on today? EM: Not as long as people will go to it. There’s not too much opera, but there’s not enough good singers to supply it all. The great singers of my era were very difficult to replace, and I feel the performances have gone down in quality because of a lack of singers. Also the whole psychology of opera is different than it was. The idea of a resident conductor who should be the focal point of this fach no longer exists in the same way. I’ve heard the greatest performers in the last 60 years all over the world, so it’s very difficult for me to sit and be patient when people are not quite up to it. When they did Walküre three years ago at the Met, there was a great scramble to find eight girls to sing the Valkeries. In the real days of Wagner at the Met – from the 1920’s through the 1930’s and early 1940’s – there were three girls for every one of the eight parts. There was Thelma Votipka, who started her career in the Chicago Opera, who was a great soprano, and alongside of her was another American named Doris Doe. She was a mezzo, and to make it complete there was also Dorothy Manski who was German. Mr. Bodanzky never wanted to conduct a performance of Walküre that he didn’t have Votipka and Doe in the cast because Thelma could jump right in and nobody would know. Doris Doe was the same with the mezzo parts. I knew Thelma very well, and this is a true story – she would often go to the opera house to sing Walküre, and ask which role she was to sing that night. It made no difference to her. That kind of thing happened because there was an era of Wagner, and you could encourage young people to study and know these things because there were potential outlets. BD: Is this true of other repertoires, or just Wagner? EM: We live in a different age now. Another thing that has happened, and not just to Wagner, is that the stars of the production are the scenic designer and the stage director. Just before my time, people went to the Chicago opera to hear Mary Garden or Galli-Curci or Ponselle or Chaliapin. In New York they went for these stars and also Geraldine Farrar and Enrico Caruso. In my era they went for Kirsten Flagstad and Lauritz Melchior. Now it makes no difference who sings. If it’s a Zeffirelli production, then [chuckles] even the cleaning woman can sing! BD: Is making such a big deal about the production a mistake? EM: I think it’s a mistake because little by little, where are the singers coming from? BD: Are there singers today who could take the place of Flagstad or Melchior? EM: We don’t know. Nobody knew about Kirsten Flagstad until she came out of obscurity. I’m not running the thing and it’s very easy to criticize – and perhaps not politically correct to do so – but years ago in Bayreuth there were those great conductors who were close to the family and knew the traditions; men like Dr. Furtwangler and Hans Knappertsbusch. Now this young Italian Sinopoli, who did an OK Tosca, is going there to conduct Tannhäuser. [See my Interview with Giuseppe Sinopoli.] This would be unthinkable years ago. People used to have to grow up to these things, and it’s not just age - Mozart died in his 30s and look what he wrote. BD: You did Wagner in New York and Chicago and San Francisco. Were the performances very much the same in each city? EM: I had pretty much the same casts all over, so the performances were similar. As it happened, I conducted Lohengrin with the Chicago company – here and on tour in Milwaukee – but the singer was René Maison every time. He also sang Siegmund in Walküre. But with Flagstad and Melchior, they knew their staging and they did their performances and that was about it. BD: Did any director ever try to do something different? EM: Perhaps in a subtle way, or if it was a new opera, of course. They did a new Flying Dutchman, and she took over Fidelio – much to the unhappiness of Lotte Lehmann – and she did rehearse for that. When she did Fidelio in San Francisco, it was a new production and she very willingly rehearsed them. Hebert Graf directed. But I remember that usually Flagstad would just go on the stage before the curtain to see the set and that was all. BD: Let me ask you about the performance of Tristan with Martinelli. EM: That was here in Chicago in 1939 and I conducted it. He did very, very well. I have a good memory for dates – it was the 24th of November, 1939, a Friday night. The following Monday we had Lohengrin and Wednesday Tannhäuser. Then we did Walküre on Saturday which was the occasion of Rose Bampton’s first Sieglinde. [See my Interview with Rose Bampton.] By the way, Marjorie Lawrence sang her first Sieglinde with me in San Francisco. But on Thursday of that week, Henry Weber, who was head of the opera company then, called me and said he had a terrible catastrophe. Lily Pons was supposed to sing Lakmé the next night (Friday) and was sick and couldn’t sing. So Weber asked me if I thought Mme. Flagstad would be willing to sing an extra performance. Flagstad was very strong and I said I’d ask her. We could do another Tristan, but by that time, Martinelli had gone back to New York. However, Carl Hartmann was here for Tannhäuser, so they asked him if he’d sing Tristan. We had no rehearsal. I went to Mr. Hartmann’s dressing room and we discussed two or three cuts in the Third Act, but they were the standard ones used the world over. BD: Should performances of Wagner operas be cut? EM: Of course they should, but as long as James Levine is in charge of the Met, they won’t be. [See my Interview with James Levine.] There’s only one cut that Levine makes and that’s the standard cut in Lohengrin which is used even in Bayreuth. But he does music that I never heard in my life except in Bayreuth. Tannhäusers the world over sing only two verses – except in Bayreuth. The Parsifal the other night lasted almost six hours. It’s too much for the public and it’s too much for the artists, but we won’t cut anything. There’s no opera house in the world – except at festival times – that doesn’t have absolutely standard cuts. BD: Are you happy with the records you made with Flagstad and Melchior? EM: On the whole, yes. Those were made before LP’s. Flagstad always felt that the Kundry/Parsifal scene made in Philadelphia was her best thing on records. After 1941, they never sang together again; they never even saw each other again. I made two trips to London in 1956-58 and made 5 LP’s of songs with her. Fortunately the Immolation Scene she made with me is no longer available. It’s fortunate because she made such a great one with Dr. Furtwangler. That was with a much better orchestra. She never OK’d the one she made with Ormandy and the Philadelphia Orchestra. She liked Ormandy very much, but she didn’t like that record. BD: Is it good that the broadcast tapes are now becoming more widely available? EM: Yes, if they’re explained properly and the people know that they’re broadcasts. She never sang a complete broadcast of Götterdämmerung with Melchior and was very unhappy about that because she would have liked to have had a recording of it. BD: Are recordings in general a good thing for the public? EM: I think recordings are a great advantage. Maybe the CD will change the whole thing but they’re so expensive. Today, though, someone living in Denver can be exposed to opera by virtue of two things – radio/TV, and recordings. We had touring opera – Fortune Gallo and the San Carlo used to come every year, but that was a piecemeal exposure to opera. But someone who has it in their blood to make a career can go to a center and be exposed to it all the time. It’s the same with languages. The hardest thing for an American is to learn to speak a foreign language because we have no opportunity to speak it. If you’re a young singer in Stuttgart or Ulm, you speak German, and if you’re a young singer in Rome, you speak Italian, and when you sing opera in German or Italian you already speak it. But here you have to study to speak it. EM: I’m not optimistic about the quality. This country, which I know pretty well, is full of enormous talent. So is Europe, but I just don’t see the outlet for it. I don’t see where it’s going to go. The whole idea of managing opera used to be impresarios – men dedicated to the art. Now it’s more business. I never cease to be shocked when I read the roster of an administration of an opera company to see “Director of Marketing.” That’s like selling corn flakes. BD: [With a gentle nudge] Opera shouldn’t be on the commodities exchange? EM: Maybe so, but it’s more than a business. People have a difficulty now growing up in opera. Another thing that’s happened in all the arts – not just opera – is that the days of the individual patrons of distinction are gone. Chicago was famous for its patrons. Edith Rockefeller McCormick, Mr. and Mrs. Charles Swift, and Charles Dawes – they don’t exist anymore. There is no longer an Otto Kahn in New York. The patrons haven’t been around since the depression, so opera’s had to be more commercialized and more informalized in the way of sponsorship. That spells a difference. BD: Is the jet plane destroying many careers? EM: Oh of course, but the young generation needs the guidance of the seasoned generation. Take as an example Erich Leinsdorf. [See my Interviews with Erich Leinsdorf.] He’s about my age, and as a young man he had the guidance and supervision of Toscanini and Bruno Walter in Salzburg, and when he first came to the Met, Mr. Bodanzky. Whom do the young people have today? Also, because things come so fast and are so commercial, I found young people are not as anxious to learn. I’ve gone to many master classes and given a few also, and one thing I try to do is to give to everybody in the class something that they can take home with them and make use of. Interviews by Bruce Duffie appear regularly in Wagner News. In addition to the names mentioned last time, the next issue will have a chat with bass Don Garrard. He will be appearing soon as King Marke in Toronto’s production of Tristan. Then in the fall, Tatiana Troyanos, and the long-awaited interview with Jon Vickers. Both of these conversations will be printed at the time of the new production of Parsifal at Lyric Opera of Chicago. Also of interest to people in the Chicago area is Nit & Wit, Chicago’s Literary Arts Magazine. This bi-monthly, which is being revived after a year’s absence from the scene, will present interviews by Bruce Duffie on a regular basis. The January/February issue has a conversation with the British baritone Benjamin Luxon, and the following issue (March/April) will have a chat with conductor Daniel Barenboim. It was Barenboim’s performance of Act II of Tristan with the Chicago Symphony that prompted the interview – some of which was aired on WNIB as a preview to those performances. Announcer/Producer Bruce Duffie is completing his 12th year with WNIB, Classical 97 in Chicago. A regular contributor to several scholarly magazines, his interviews appear both in print and on the air. In these pages later this fall, his chat with soprano Anna Tomowa-Sintow, who will be returning to Lyric Opera of Chicago. Then in January of 1988, a conversation with conductor Maurice Abravanel in honor of his 85th birthday. Abravanel led Wagner performances in Australia in the mid 1930s, and has some interesting remarks about his adventures. A year from now, a conversation with director August Everding to mark his 60th birthday. These and others coming soon in these pages. This interview was recorded in Chicago on April 14, 1985. Sections were used (along with recordings) on WNIB in 1987, 1995 and 1997. It was transcribed and published in Wagner News in September, 1987. It was re-edited, photos and links were added, and posted on this website in 2012.